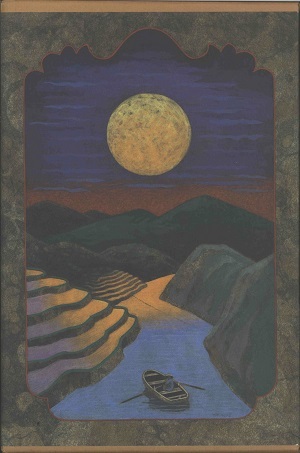 This is the second limited first edition of Finding Moon; however, unlike the first limited edition the slip case features the artwork of noted Hillerman cover artist Peter Thorpe. There are three panels (cover, spine, and back cover) all featuring plot elements. While the themes of these panels is decidedly Southeast Asian influenced, Thorpe's style remains the same as it was for the Navajo Mystery Series. This gives the panels a sandpainting feeling despite the change in location of this novel. This edition was published in 1995 by HarperCollins Publishers in New York City, New York. Format: Hardback, 24 x 16 cm. Binding: Tan boards with dark green cloth spine. The author, title, and publisher are printed vertically in metallic copper on the spine.